Copyright © 2002 by M. Mukhopadhyay. All rights reserved. 1) After independently coming up with this unit I discovered that Jeannine Mosely came up with it as well. 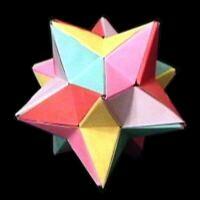 2) The finished unit in step 5 can be used for constructing both the lesser and the greater stellated dodecahedra. 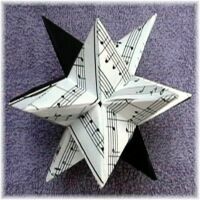 But I've also suggested trimming of the paper for a greater stellated dodecahedron-like assembly with 45° angles at the tips. This eliminates too much overlap of paper at the tips of the assembly. Here are some YouTube instructions by Karl. 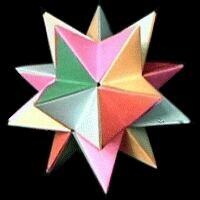 Rhombic Triacontahedron with rhombic unit.